This means that you can add item-specific data which will remain constant, no matter where the object is applied. If changes are made to the risk itself, these changes will be carried out wherever the item is applied. You can also add unit-specific data to the item when it is applied to different units, or to a process or template. ABC Corporation has a corporate head office, as well as a factory warehouse. One of the risks identified by Managers in terms of Health and Safety Compliance regulations is the risk of fire. The risk is created in the Process Tree, and then applied to both units. 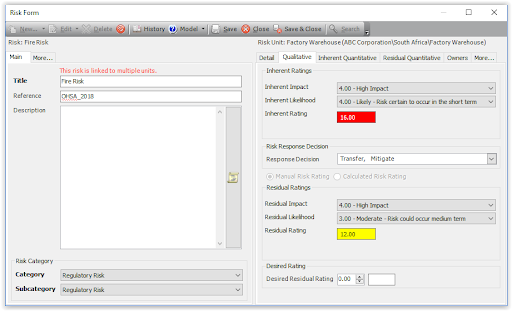 This shows the Risk form for the Corporate (Head Office) unit. The information on the left side of the form is item-specific, relating to the risk of fire itself. Any changes made to the information on the left will be applied throughout. Therefore, if you change the Reference, or add a description, the information will be updated wherever the risk has been applied. The right side of the form contains information about the risk which is only applicable to the unit, template or process where the risk is applied or captured. This includes a detail tab., as well as ratings, owners and custom field tabs (more…). 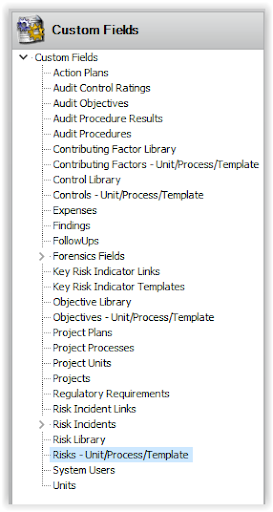 The unit, template or process where the risk is being viewed is displayed at the top right of the form. 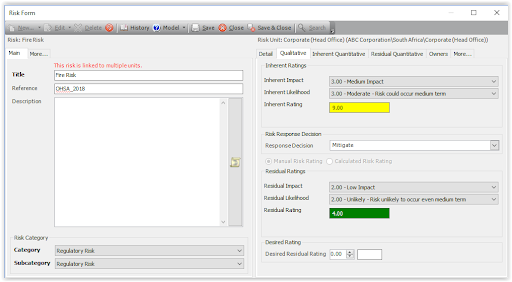 As you can see, the Residual risk rating for this risk is 4.00 in the Corporate unit. This is because there are effective controls in place, and the number of contributing factors are fewer at Head Office. However, if we look at the same risk in the Factory Warehouse unit, the ratings are different. This is because the impact of fire in the warehouse is much higher, and the likelihood of fire occurring is also high. As you can see from the form, there are now two More… tabs, so you can create custom fields which are specific to the item, as well as custom fields which are specific to the unit, template or process custom fields. The custom fields on the left side of the form will remain constant, wherever the item is applied. The custom fields on the right may differ from unit to unit. Custom fields created against the Risk Library node will be displayed on the More… tab on the left side of the form. Custom fields created against the Risks – Unit/Process/Template node will be displayed on the More… tab on the right side of the form. For more information about this, see About Item vs Unit, Process and Template Custom Fields.